EDINBURG — Her health deteriorating, Gloria Gabriel said she required the help of her mother and even her children to hold her upright. Gabriel said she was diagnosed with rheumatoid arthritis and lupus, among other diseases in 2012, but that it was the treatment for those ailments that had caused her physical damage. The former patient of Dr. Jorge Zamora-Quezada, a rheumatologist who last week was indicted on charges of health care fraud, traces back her pain to when she began to see him. The doctor, who practiced in Edinburg, Brownsville and San Antonio, is accused of falsely diagnosing and mistreating patients to defraud health insurers for profit. 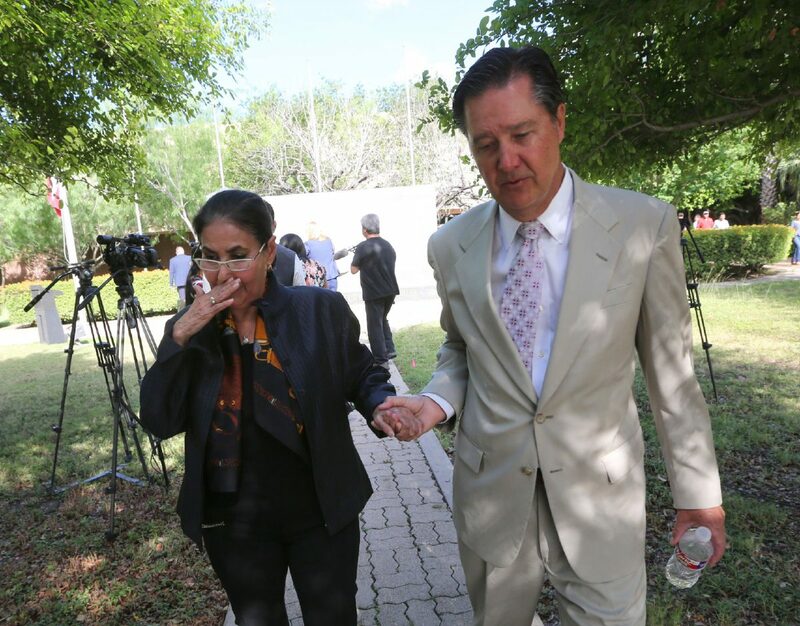 Gloria Gabriel walks with her attorney Brian Berryman following a news conference about her alleged misdiagnosis by Dr. Jorge Zamora-Quezada Monday, May 21, 2018, at the Hidalgo County Courthouse in Edinburg. Zamora-Quezada was recently indicted on charges relating to health care fraud and money laundering. Gabriel, from San Antonio, said she was active and described herself as a multitasker before seeing Zamora-Quezada. She appeared at a news conference with attorneys from Watts Guerra LLP, who are representing her and another former patient in filing claims against Zamora-Quezada. On behalf of the two patients, Watts said they are in the process of filing a notice of a claim to the doctor, which is required under state law. The second patient, Christina Deras, was unable to travel from San Antonio because of her health, according to Brian Berryman, a partner at Watts Guerra LLP. In her stead, Deras’ daughter, Lucinda Rico, explained Monday that since receiving treatment from Zamora-Quezada, her mother’s health condition had worsened. Deras first saw Zamora-Quezada in 2010 and was also diagnosed with rheumatoid arthritis and fibromyalgia, her daughter said, and was prescribed chemotherapy drugs. After the notice of a claim, Watts said they would send an authorization for medical records release and then send those off to another rheumatologist to evaluate those records. The goal, Watts said, is to conduct the medical analysis necessary to demonstrate who is a victim. 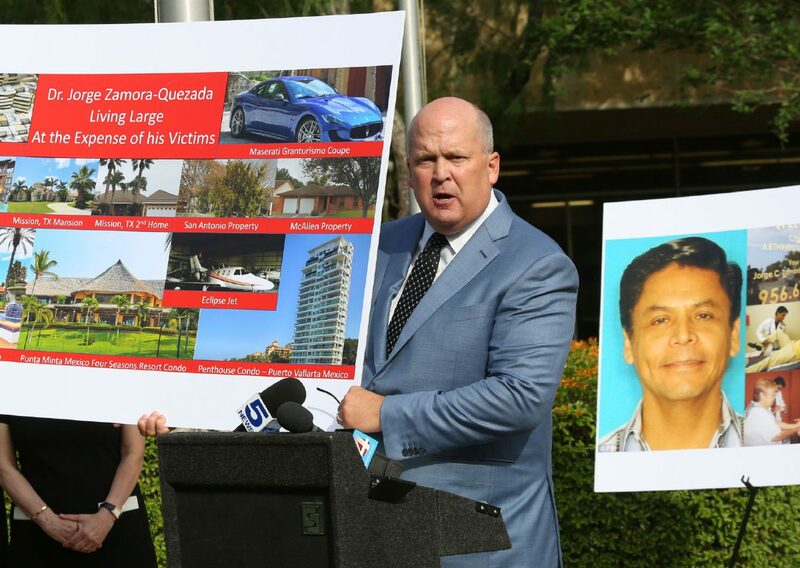 Zamora-Quezada was charged last week with defrauding health insurers by allegedly mistreating patients based on misdiagnoses in order to support his “lavish” lifestyle, according to the federal indictment unsealed last week. The charges in the seven-count indictment include one count of conspiracy to commit health care fraud, five counts of health care fraud, and one count of conspiracy to commit money laundering. The attorneys from Watts Guerra LLP said they urge other potential victims to come forward, and said they announced they are launching a media campaign to educate people about their rights. Anyone who believes they may have been misdiagnosed by Dr. Zamora-Quezada can contact texashealthcarefraud.com. Last week, the FBI announced they were also trying to identify the doctor’s possible victims. Patients of his between January 2000 and May 2018, are urged to contact the FBI through the victim’s hotline at (833) 432-4873, option 8. They can also contact the agency through email at ZamoraPatient@fbi.gov. Gabriel also called on other potential victims to come forward.